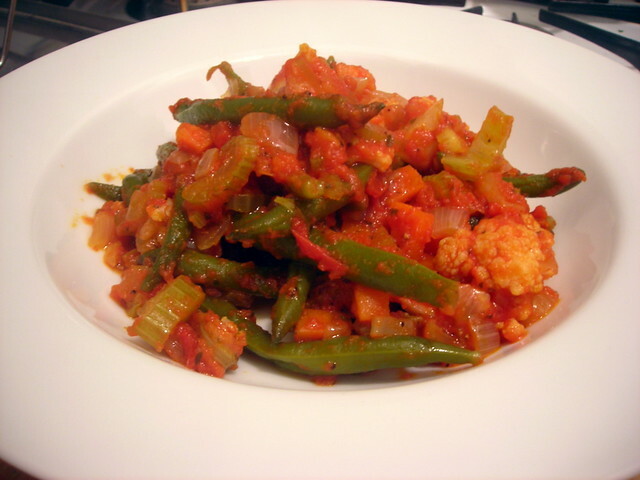 I love the combination of green beans and cauliflower braised in tomato sauce. The usual combination is fagiolini in umido (“green beans, stewed in tomato sauce”); the addition of cauliflower gilds the lily, in my opinion. There are variations where the sauce is fairly thin and brothy, the better to sop up with hunks of bread. My version is a bit heftier; it begins with a soffritto of celery, carrot, onion and celery leaves, to which crushed tomatoes and herbs are added. This is left to simmer for close to an hour, and can be made in advance. Eventually, you end up with a plate of vegetables that have been suffused with the essence of tomato. It’s a glorious reminder of summer in every delicious forkful. It’s important to cook the green beans and cauliflower until the right degree of doneness is achieved. It’s also nearly impossible to give a cooking time, since it depends on whether you’re using young green beans or more mature ones. The vegetables should be tender but not soggy, water-logged or overdone. Bring a large pot of lightly salted water to a boil. Add the green beans and cauliflower. Bring to a boil, then reduce heat to medium-low and simmer for 5-10 minutes or until the beans and cauliflower are crisp-tender. Drain and set aside. In a large pot or Dutch oven, warm the olive oil over medium-low heat, then add the onion, carrot, celery and celery leaves. Sauté the battuto, stirring occasionally, until the vegetables become softened, about half an hour. Do not let the vegetables brown at any point. Add the crushed tomatoes, parsley and oregano, a ladleful or two of water, along with a large pinch of sea salt and black pepper. Reduce heat to low and partly cover. Let the sauce simmer for 45 minutes to an hour, stirring occasionally. Add the green beans and cauliflower to the pot. Mix well. Cook the green beans and cauliflower, partly covered, or until they become quite tender, stirring occasionally every so often. If using young green beans, the cooking time can be as little as 10 minutes. If the beans are more mature, this can take up to 30 minutes. Taste once more for salt and pepper. Spoon the vegetables into shallow serving bowls or plates, drizzle with extra-virgin olive oil, then serve immediately. This recipe is sized for roughly 4-6 side dish servings or 3-4 main dish servings. Time: About 2 hours, including prep. 14 Aug	This entry was published on August 14, 2013 at 1:43 pm. It’s filed under food, food photography, Gluten-Free, Italian food, recipe, summer, vegan, vegetarian and tagged cauliflower, food photography, gluten-free, green beans, Italian food, side dish, summer, vegan, vegetarian. Bookmark the permalink. Follow any comments here with the RSS feed for this post. Love that dish. I usually do it with romano beans and a little addition of tomato paste.